Cairo (Agenzia Fides) - The Coptic Orthodox Church invites its faithful and all Egyptian citizens to participate in the upcoming presidential elections, to be held in Egypt from 26 to 28 March, but does not express preferences and does not intend to direct the vote of Coptic Christians in favor of a single candidate. This is the message contained in a statement released by official sources of the Coptic Orthodox Patriarchate a few days before the opening of the presidential elections that will sanction the foregone victory of Abdel Fatah al Sisi, current Egyptian President running for the second mandate. The statement most probably intends to represent a response to the critical voices of all those who consider the excessive stance of the Coptic Orthodox Church in support of President al Sisi. 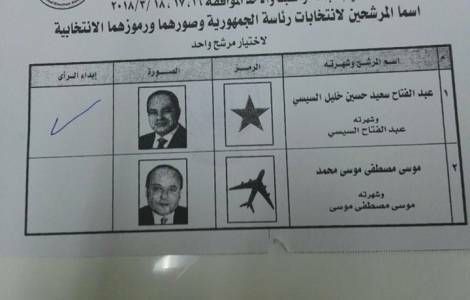 In recent days (see Fides 14/3/2018), the Coptic Orthodox Church had already issued an appeal in support of popular participation in the upcoming elections, also re-launched by the Egyptian media.